In this ‘meta collection’ of dark contemporary fantasy, a series of loosely tied tales of dark fiction and supernatural encounters are strung together as the work of fictional writer Victor Coachman. But it is not just his stories themselves that are presented in this book, but their consequences for both the writer and his fate. 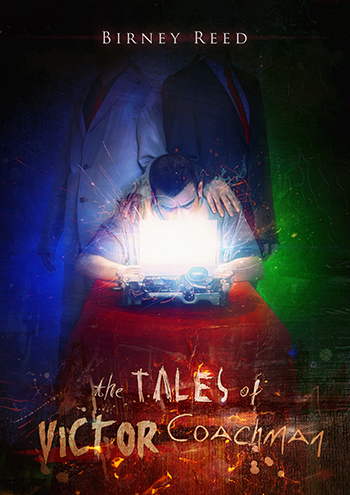 The Tales of Victor Coachman is a single author collection presenting 13 original stories of modern fantasy, horror, and the supernatural from Columbus Ohio author Birney Reed, collected in print for the first time. The book features cover illustration and design by Spanish surrealist Mario Nevado. As a self proclaimed “jack of all trades” and master of none, Birney Reed has worked as a dishwasher, an actor, singer, truck driver, short order cook, bartender, salesperson and CEO of a successful advertising firm. He took up writing 15 years ago, all because of a book he had just finished reading and a picture window he happened to throw it through. Sadly, Birney passed away in early 2015; he is missed by all.